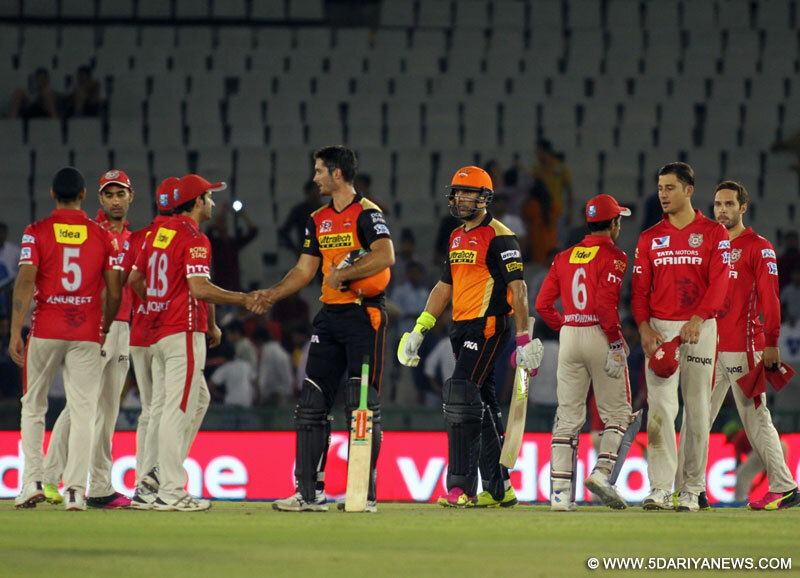 Sunrisers Hyderabad strengthened their position at the top of the points table with a seven-wicket win over Kings XI Punjab at the Punjab Cricket Association Stadium here on Sunday.Chasing a challenging 180-run target, Hyderabad clinched victory with two balls to spare thanks to some late display of powerhitting by Yuvraj Singh and Ben Cutting.Coming together with four overs to go and the visitors still needing 41 runs, the duo exploited some poor bowling by Punjab pacers Sandeep Sharma and Mohit Sharma as Hyderabad finished at 180/3 in 19.4 overs.Yuvraj remained unbeaten on 42 runs off 24 balls with three boundaries and an equal number of sixes. Cutting, who hit the winning runs, was not out on 18 off 11 balls.Sunday's result saw Hyderabad take a two-point lead over second-placed Kolkata Knight Riders with 16 points from 12 matches. Punjab, meanwhile, virtually kissed goodbye to their chances of making it to the play-offs as they remained second from bottom with eight points from 12 matches. The visitors had seen their chase get off to a promising start with opener David Warner going great guns. His fellow opener Shikhar Dhawan seemed to be in good touch with 22-ball 25 which included four hits to the ropes before being run out due to a superb piece of fielding by Mohit Sharma.But Deepak Hooda (34 off 22) continued to give Warner good support from the other end as the Australian continued to go after the Punjab bowling. But Warner's habit of standing deep inside the crease cost him dearly when he attempted to flick an Axar Patel delivery off his pads but his back foot hit the wicket, dislodging the bails in the process.Warner scored 52 runs off 41 deliveries with five boundaries and a six. The Australian's departure saw Yuvraj Singh stride out to the middle and the local lad used his knowledge of the conditions to good effect and led the visitors to victory. Patel (1/26) and Sandeep Sharma (1/35) were the only Punjab bowlers to earn a wicket.Earlier, Hashim Amla ended his run of form in spectacular fashion to lead the hosts to a challenging total of 179/4 in their 20 overs.Playing in his first IPL, the South African veteran smashed 96 runs off 56 deliveries to register his first half-century of the tournament. Out of his previous three matches in the IPL, the 33-year-old had managed to reach double figures only once.Opening the innings along with Murali Vijay, Amla went on to become the mainstay of the Kings XI innings. He batted till the final over, producing crucial partnerships of 65 runs and 54 runs with Gurkeerat Singh and Wriddhiman Saha, respectively. Hitherto known as a technically correct batsman more comfortable in Test cricket, the experienced right-hander showed he can adapt to the 20-over format as well with some superb improvised shots which were a treat to watch. His superb effort with the bat earned him the Man-of-the-Match award.Amla missed out on what would have been a well-deserved century when he attempted to hit the fourth ball of the final over out of the park. But he could not get the timing right and could not get enough bat on it and holed out to David Warner at long-off.With Amla going great guns, Punjab had a quick start to their innings before the in-form Vijay (6) fell to a slower delivery by Mustafizur Rahman thanks to a poorly executed shot.However, Saha (27 runs off 23 balls) and Gurkeerat (27 off 20 balls) helped Amla to maintain the scoring rate. David Miller then produced an unbeaten cameo of 20 runs off just nine deliveries as the hosts ended their innings on a strong note. Among the Hyderabad bowlers, Bhuvneshwar Kumar returned figures of 2/32 including the prized scalp of Amla, while Moises Henriques (1/29) and Mustafizur Rahman (1/32) were also among the wickets.Brief scores: Kings XI Punjab 179/4 in 20 overs (Hashim Amla 96; Bhuvneshwar Kumar 2/32) vs Sunrisers Hyderabad 180/3 in 19.4 overs (David Warner 52, Yuvraj Singh 42 n.o., Deepak Hooda 34; Axar Patel 1/26, Sandeep Sharma 1/35).